If you're looking for a kid toy or a desk toy, these are the fidget spinners you should consider. 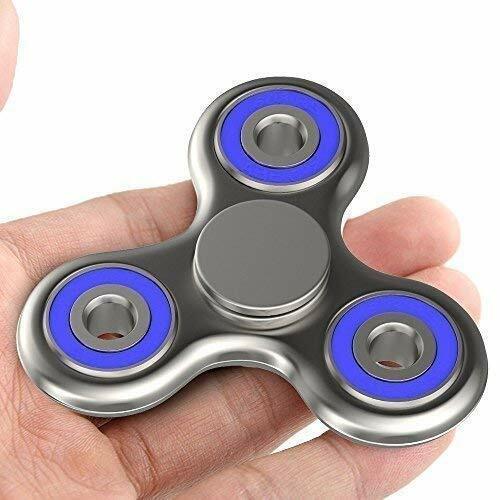 Fidget spinners were designed to help kids with ADHD channel their nervous energy. They were used as unproven therapeutic tools for years until they blew up a few years ago. 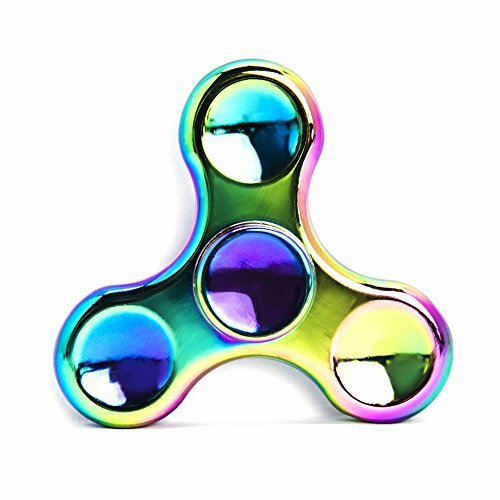 Kids love spinning and collecting them, and there is even an active fidget spinner trick community sharing videos on YouTube. For adults, rotating the low-friction spinners can be relaxing, and spinning can supplant a range of more distracting nervous ticks in the same way a stress ball might. And while it may seem like they’re all the same, there are actually tons of companies manufacturing them in every shape, size, color, and material (from plastic to titanium). Unfortunately, it’s easy to spend money on a cheap model that won’t last or an expensive one that isn’t worth the premium. Our favorites are moderately priced and worth it. They are built well out of solid materials, spin smoothly and quietly for at least a couple of minutes (depending on the skill level of the spinner). Whether you’re in the market for a spinner for yourself or your kid, these are the ones to consider. Hello, Muggles! 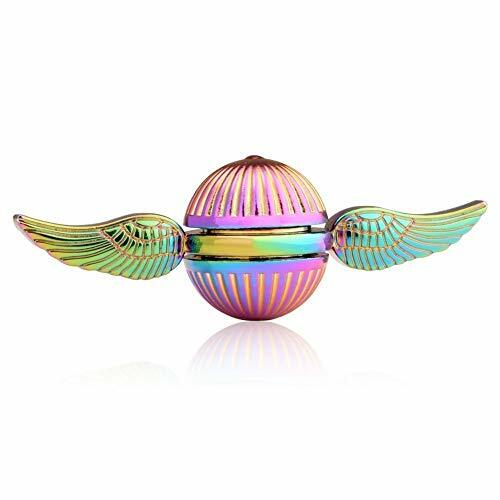 Fans of Harry Potter will love this Quidditch-inspired fidget spinner that looks just like the coveted golden snitch. 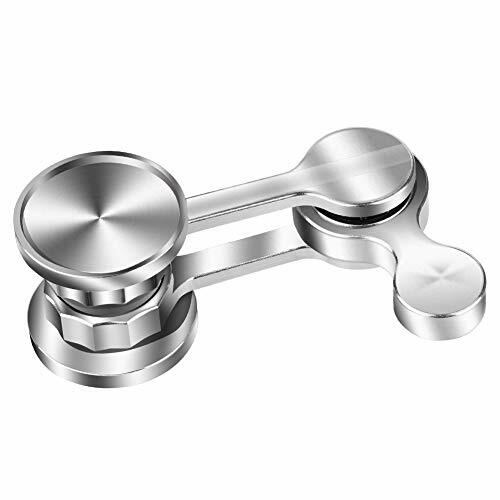 Pros: This fidget spinner features a metal alloy body and stainless steel bearing, and provides on an average spin that lasts one minute and is quiet and smooth. Cons: It’s not the most durable spinner in the world, so if your kid has a tendency to be hard on their toys you should opt for a harder-to-break model. The Anti-Anxiety 360 showcases the classic three-pronged design ⏤ by far the most popular spinner shape. In addition to the high-speed center bearing, users can also give it a whirl by holding the individual balancers, which spin independently and produce a different sensation. Pros: The manufacturer claims a spin time of one to three minutes. Choose from the brushed gold and chrome options or the kid-favorite glow-in-the-dark finish. Cons: The plastic body of this fidget spinner isn’t as weighty or satisfying as those of metal options. The people at Antsy Labs do a lot of things well, but estimating clearly isn't one of them. 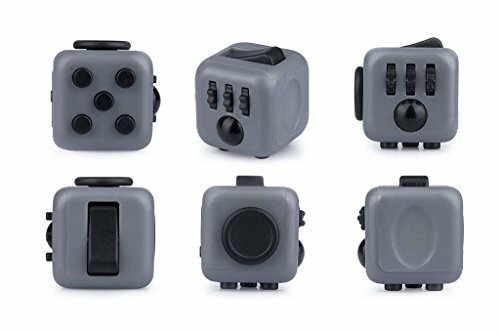 The Denver-based company launched a Kickstarter campaign for the Fidget Cube in 2016 with the goal of raising $15,000. It raised over $6.4 million, or approximately 431 times the original goal. 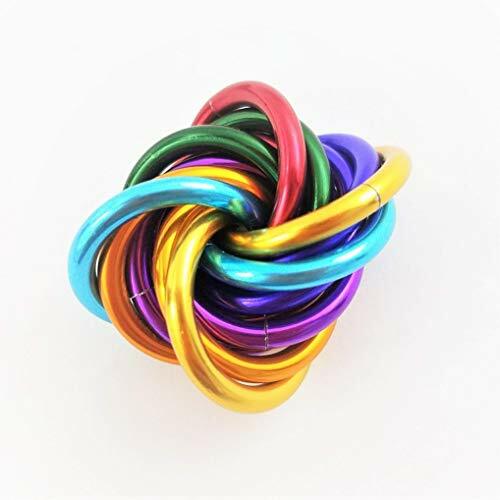 Pros: This non-traditional fidget toy offers six different fidgety mechanisms: a button to click, switches to flip back and forth, a joystick to toggle, a dimple to touch, an array of five pegs that are oddly satisfying to play with, and, of course, something that spins. Cons: What it has in different fidget options it loses in classic spinning action. This is not the toy to buy if your kid wants a fidget spinner. The first thing to notice about this spinner is its unique shape. Instead of one centrally located pivot point, it has two. That means the center of gravity changes constantly as you spin it, producing motions that feel more random than the smooth, but to some uninteresting, spinning of a typical, symmetrical spinner. Pros: The central pivot point on this fidget spinner has ten R188 stainless steel ball bearings that provide a smooth, quiet spinning experience. If standard spinners are as entertaining as they once were, this one is a great way to mix things up. 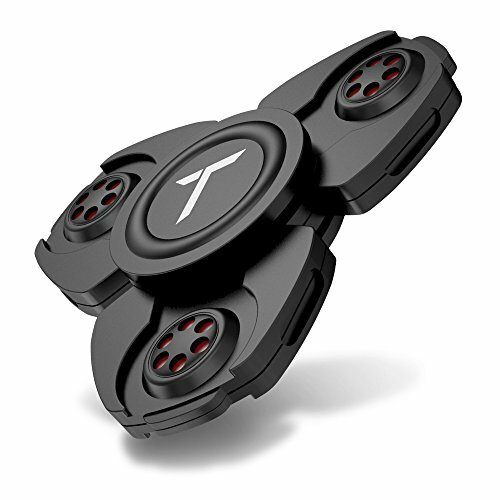 Cons: Some kids like both handheld and tabletop spins, but the nontraditional design of this fidget spinner means it’s limited to the former. The matte black finish of this metal spinner reminds us of the Batmobile from Christopher Nolan's Batman movies: vaguely militaristic, aggressively masculine, and sleek without being shiny. 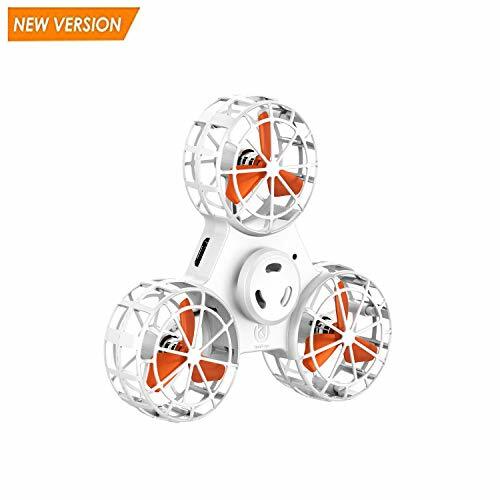 Pros: The steel ball bearings in the center come lubricated with a specialized oil that the company claims helps this fidget spinner spin faster and longer and reduces the chance of corrosion and issues with the bearings. And speaking of bearings, this spinner comes with both “therapeutic” and “performance” bearings that you can swap out. The former is meant to be louder and produce shorter spins while the latter is designed for longer, quieter spins. Cons: Changing the bearings isn’t exactly a painless process. It requires a screwdriver and the delicate application of pressure. The big draw here is the crazy finish on this spinner, a shiny rainbow effect that looks cool when it's not moving and mesmerizingly trippy as it spins round and round. Pros: It’s two and a half-inch frame is made from stainless steel and weighs just over three ounces, enough to feel solid in the hand and satisfying to tilt back and forth while it spins. This fidget spinner comes in a round tin with a clear top that shows off its colors even when not in use. Cons: Some reviewers have said that their spinners arrived imbalanced, which means they don’t reach the 3-5 minute spin time promised by the manufacturer. 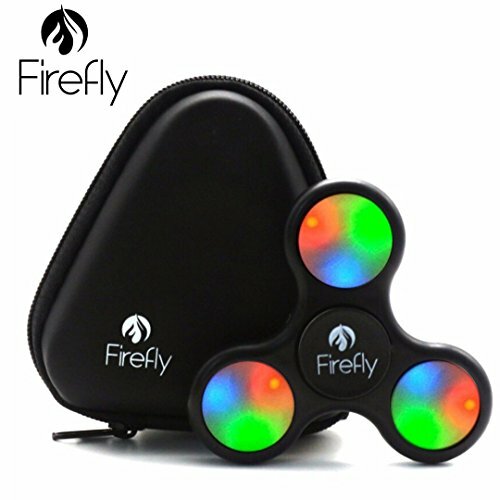 This spinner comes complete with a triangular carrying case and extra battery. Pros: At first glance, this fidget spinner looks pretty standard. All five of its finishes are pretty plain, and its shape and size are standard. Press down on one of the balancers, however, and the three LEDs in each balancer light up. Press down again to cycle through the five different patterns the lights, which can emit red, green or blue light. Experimenting with what those lights look like while spinning adds an extra layer of fun to this fidget spinner, another wrinkle that can entertain kids who’ve become jaded with normal spinners. Cons: A big benefit of fidget spinners for parents is that they don’t need batteries. That obviously goes out the door with this model, which uses watch batteries you may not typically have on hand. Not only is the design crazy-cool, but it's discreet and totally functional. Pros: Yes, it’s pretty to look at. But this bright Möbii fidget ball fits right in your pocket, and is a handy way to release stress or deal with boredom. The rings are woven together so that you can rotate the rings through and spin them. Cons: At only an inch wide and three-quarter of an inch tall, this toy is a choking hazard that’s not great for younger kids. Two of the biggest toy trends of the past few years come together in this bananas toy, a fidget spinner that activates motors when spun, motors that make it fly like a drone. It's pretty damn cool. Pros: There’s a lot more fun to be had when your fidget spinner flies. Kids can toss it up in the air in boomerang mode, where it obviously will come back to you, as well as suspended, low altitude, and dive modes for even more varied play. Cons: If you’re looking for a toy that can help your kid avoid distraction, this is not it.